On the face of it, the ambitious Sethusamudram project to bridge the east coast with the west coast of the country seems a great idea. The prospect of not having to circumnavigate Sri Lanka and cutting short travel periods by 30 hours sounds as interesting as it did 150 years ago when a draft plan for the canal was first mooted. A Tamilian dream is now beginning to take shape. It is but natural for a project that has been in the pipeline for so long to be mired in controversies. Several areas of utmost concern relate to the welfare of fisherfolk living in the neighbouring districts and the biodiversity of the area, which is likely to be irrevocably damaged by the dredging that is currently taking place and is a pre-requisite to the deepening of Adam's Bridge and Palk Straits for vessels to ply along the 167.5 km long canal. As always, the nitty-gritty has not been adequately thought through and local interests subverted in the name of grand ideas. The problem of thinking the project through is compounded by the complex political weave entailed by federalism -- in this case what the state government wants, what the Centre hopes to achieve and the interests of local people whose livelihoods are at stake. The fact that the political alignments in the state are often at odds with central imperatives does not help. The project and its proponents have been excoriated by fisherfolk and environmental activists for not giving due recognition to issues concerning the welfare of the fishing communities and the ecological needs of the area. 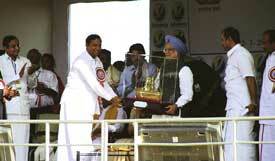 Despite all the scathing criticism and several public hearings, the project was officially launched by prime minister Manmohan Singh and United Progressive Alliance chairperson Sonia Gandhi at Madurai on July 2, 2005. kushal pal singh yadav toured the area to check out the ramifications of the Sethusamudram project. The channel across the Palk Straits between India and Sri Lanka is expected to be operational by 2008: it will allow ships sailing between the east and west coasts of India a straight passage through India's territorial waters, instead of circumnavigating Sri Lanka. India doesn't have a continuous navigable route here due to the presence of a shallow ridge (1.5 metre to 3.5 metre deep) called 'Adam's Bridge'. The Palk Bay is also too shallow for navigation (see map: Heavy weather). The Rs 2,427-crore Sethusamudram Shipping Canal Project (sscp) will create a continuous ship channel by dredging Adam's Bridge and the shallow parts of Palk Bay. The channel's total length will be 167.5 km. Of this, about 90 km needs dredging, which will be done for 35 km length in the southern leg at Adam's Bridge and for a length of 54 km in the northern leg at Palk Straits. Intervening stretches of Palk Bay, not requiring dredging, is 78 km long. Dredging will be done to achieve a depth of 12 metres for ships with a draft of 10 metres -- those that reach 10 metres into the water. In terms of weight, a fully-loaded 30,000 deadweight tonnage ship will sail through. Deadweight tonnage is the maximum weight that a ship can safely carry when fully loaded, including the crew, passengers, cargo, fuel, water, and stores. The breadth of the channel at the sea bottom will be 300 metres (see map: Salient features). Project authorities claim the canal will save up to 780 km (and 24-30 hours per trip). In 1997, the Union ministry of shipping (mos) appointed the Tuticorin Port Trust (tpt) to implement the project. The government took its first concrete step towards the execution of the project by allocating Rs. 4.8 crore for feasibility studies for the sscp in the 2000-2001 Union budget. At that time, the Dravida Munnetra Kazhagam (dmk) was part of the ruling National Democratic Alliance. In 2002, the National Environmental Engineering Research Institute (neeri), Nagpur, was appointed by the mos to do a techno-economic viability study and the environmental impact assessment (eia). In 2004, the Tuticorin Port Trust appointed l & t -Ramboll Consulting Engineers of Chennai to prepare a detailed report. In September 2004, the Cabinet committee on economic affairs gave its approval. The Centre launched the project in July 2005 and created the Sethusamudram Corporation Limited (sscl). Other promoters include tpt, Chennai Port Trust, Ennore Port Company, Visakhapatnam Port Trust, Paradip Port Trust, Dredging Corporation of India (dci) and Shipping Corporation of India. The canal is scheduled to become operational by November 2008. dci has got the dredging contract for one section and work has begun. Global tenders were floated for contracts on other sections. "There was global bidding but unfortunately it was not successful," says N K Raghupathy, chairperson of tpt and sscl . It is learnt that Hyundai had reached the final round of bidding. "There were some unreasonable conditions that the bidders were insisting upon that were unacceptable," he adds. A second round of tendering is likely to start in March-April of 2006. However, the failed tendering process is not the only problem that has plagued this project.